With a whole pile of guitars laying around I decided I didn’t want to break another one that I just repaired so I figured I would build some guitar stands. I looked around on Google and saw some that I liked, but they were pretty fancy and all I wanted was a simple design, easily built, no nails or screws and it had to be stable. This is what I came up with and I’ll probably build 5 or 6 more. I meant it as just a template or pattern to make the rest from, but some design changes occurred to me that I wanted to try. I ended up finishing this one so I’ll have to make another pattern. The wood is black walnut sapwood that I had laying around. It looked way too light to me so I used a coat of Chippendale Mahogany dye, sanded back down to almost gone, then a dark red cherry dye. I’m not fond of how it came out, but it will do for practice. There are 4 coats of Deft Clear rattle can lacquer on it for the finish. To protect the wood of the guitar I used thick leather cut into strips. The piece that steadies the neck was an after thought and is made from spalted sycamore scrap I found in the trash. Good move to protect the fix jobs already done Dallas! Nice prototype. I like the dark stain and the leather. Is there a design burned into the upper cross piece? Are the through tenons secured with anything other than glue? Looking forward to the next versions. Thanks for sharing. I like the stand Dallas, simple yet it does have flare. Nice work!! I don’t know if I want to sell any of these or not, I haven’t figured out a final finished design yet and the more I play with it the more it seems to be habit forming. Candy the design on the upper piece is my brand. I held it on too long when the wife came in and gave me some orders, ummmm Suggestions. I should have sanded the dye down some more because after putting the lacquer on it kept getting darker. It’s difficult to see the grain of the walnut. 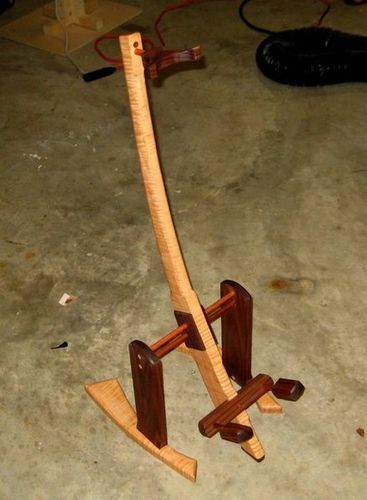 It does however remind me of a guitar stand my uncle had many years ago. Not the shape so much, but the color. It reminds me of the grime and dirt and cigarette smoke that built up on it from being in a bar every weekend for decades, LOL. The tenons aren’t glued in at all. I just used walnut chunks that I made with a round over bit to match the round end of the mortise. After all, this was never suppose to get to this point of being finished. I have to think about these things a bit. I think the design needs more shadow lines or some profile, it looks kind of plain to me. Great job, Dallas, but it might be TOO substantial. Have you seen this one? John, to me that just doesn’t look stable, especially with a big dreadnought acoustic. Especially if one of my feeder cats decided to play the guitar.